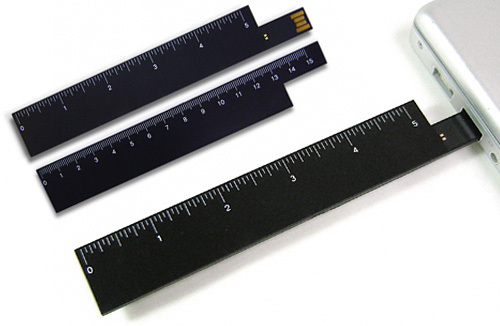 2GB Flash Drive Ruler Is Slightly More Useful | OhGizmo! When was the last time you used any of the flash drives you have kicking around to measure something? That’s right, never! So as long as that ‘something’ is no longer than 5 inches, or 15 centimeters, this 2GB flash drive ruler becomes slightly more useful than your run-of-the-mill flash drive. And it would be even more useful if it was bigger than just 2GB, which is kind of small given the $35.99 price tag on AudioCubes.com. The issue is, forgetting it's there or just accidentally hitting it and breaking it. I can see myself doing something like that. I think it's cool that they are trying to make them multi-use but I see it as a hazard to me.